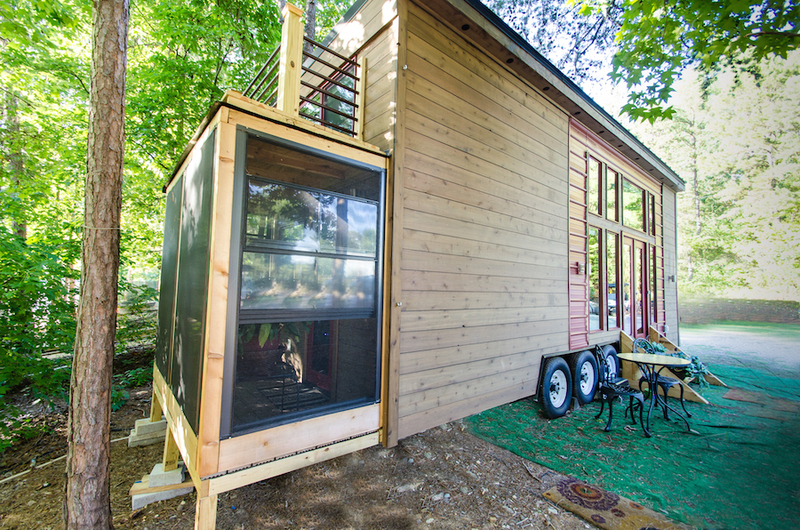 A tiny house on wheels in Charlotte, North Carolina. Photos by Glyn A. Stanley Photography. Owned and shared by Jewel Pearson. More info. Ms Gypsy Soul. This is the nicest tiny home I’ve come across. I love the fact that the living room actually fits a beautiful sofa. The colours are bright and classic. Beautiful and functional bathroom. The stairs and railing actually look safe. 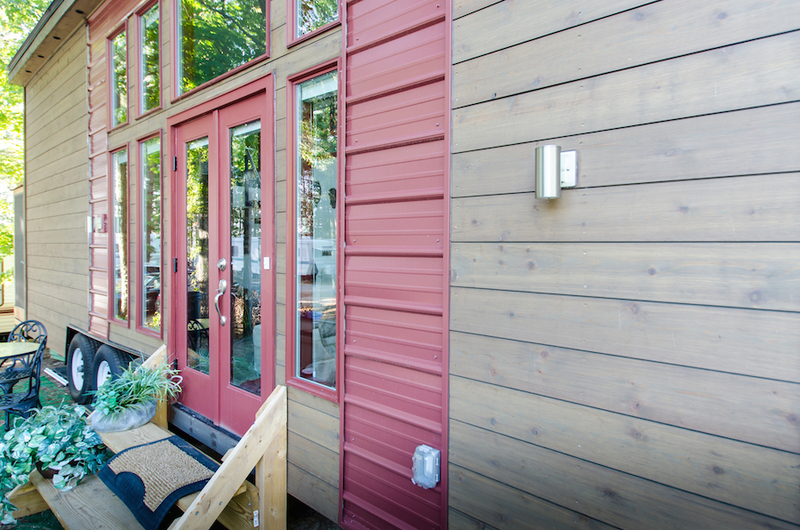 In most of these tiny homes, they either have a ladder (scary) or stairs with no railing (still scary). I think I would have added storage under the stairs. 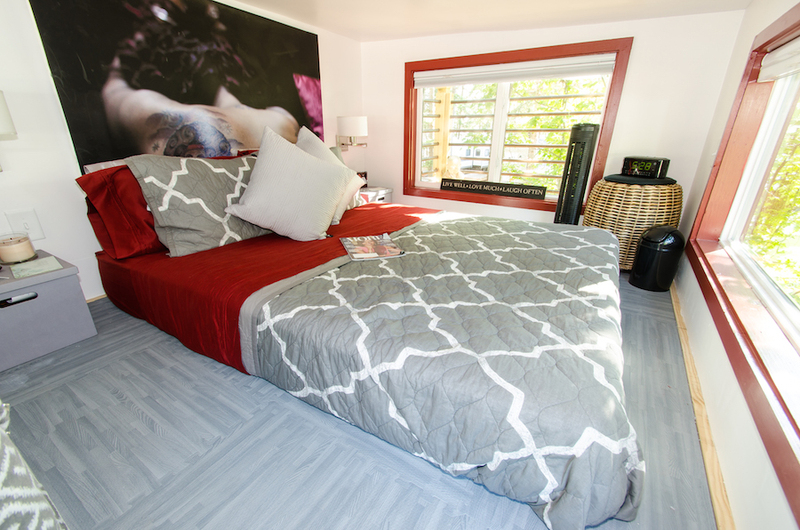 The loft bedroom is so high that you don’t feel claustrophobic. The windows make this home feel so bright and cheery (nice window coverings). I like the sunroom and there appears to be an upper deck. The table & chair in the corner actually is so enticing with all the windows that you actually would want to sit there to eat or work on the laptop. Love the lighting she chose. This is such a feminine tiny house that it appeals to me completely. I would like Jewel to add pictures of the kitchen. I would like to know the dimensions, the square footage and the cost to build. Saw your tiny house today. Amazing and the most space efficient space I’ve seen and you have a closet!!!! It’s cool because it also is geared to YOU. Praying for much success, joy and love for you in the New Year. The loft with “simplicity” on the wall seems like a bit of a waste of space. Seems a tad inconvenient to get to (yes, I see the access on the wall). Sometimes it feels as though people make Tiny Houses just to show off their decorating skills, rather than a functional Tiny House. I am not discounting the importance of appearances, but it’s just an observation. The reality is; function is most important. Otherwise people are simply building tree houses. Other than that, the places seems ok. Props for sticking with a theme. Just seems like a lot of wasted or misused space. I like the abundance of windows. How are you going to tell someone what works for them? 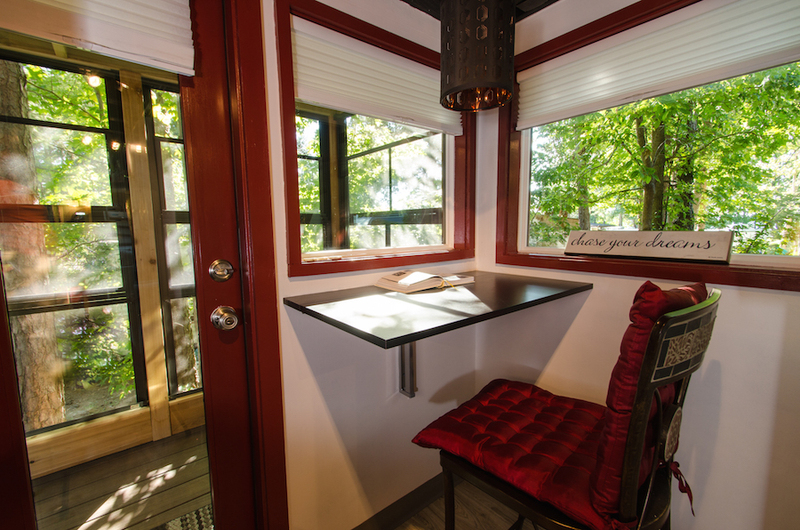 You decorate and fill up space in your tiny house the way you see fit and let others do what works for them. It doesnt matter what purpose she has her tiny house for, to show off decorating skills or not, its hers so she can do what she wants with it. There is no law saying tiny houses must be functional to your standards. The reality is, whatever she wants to be the purpose is her purpose and it obviously works for her so don’t worry about it. You do you and she will do her. Everyone doesnt have to think like you. If you saw this episode on television, she has a standard size closet with MORE than enough storage for a tiny home. Jewel chose to deliberately focus on making it “un”tiny in that regard (storage/function over style) because she could afford to since she made provisions for enough storage. Her design in this regard is absolutely BRILLIANT. Personally I think she has a career if she wants in Tiny House design. I’d hire her to build one of these to be on a lakefront property like hers is. This design is FLAWLESS, and the IP FREELY comment proves that since the design comes across as “focused on appearance only” when it actually is not at all. 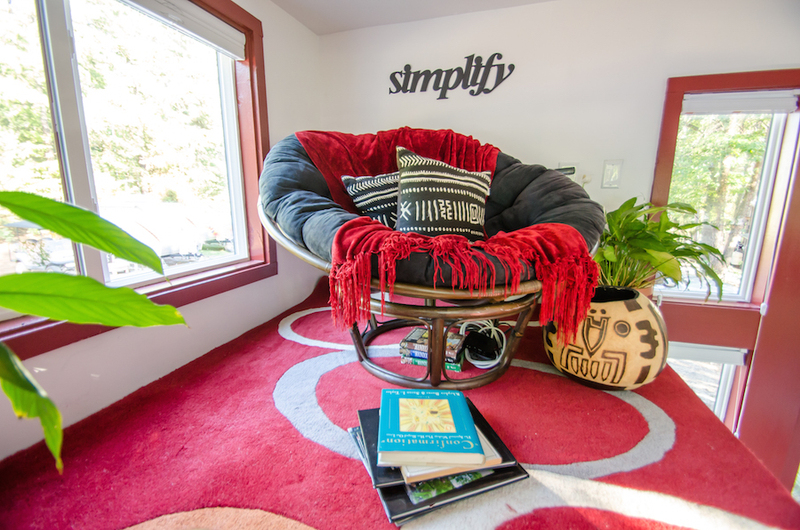 The simplicity wall is a reading nook. Waste of space? Not at all. 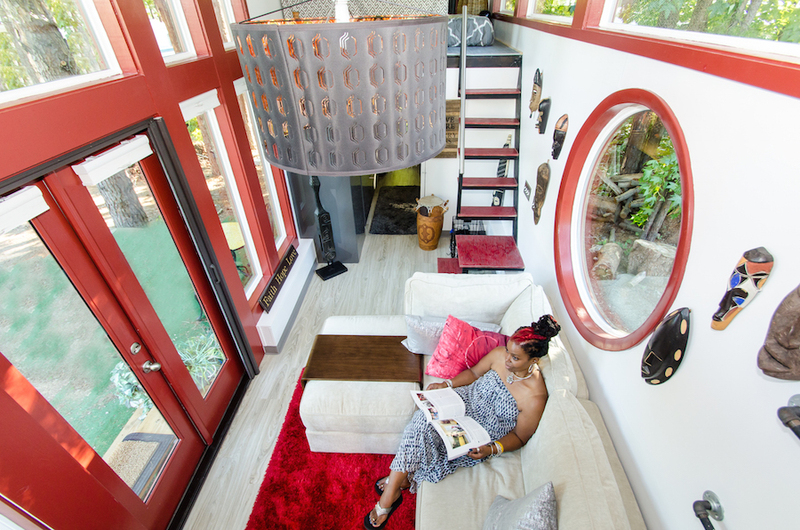 With all of the storage she already incorporated, the reading nook was by design. Simply ingenious. The Juliet balcony, the screened in porch, room for a REAL sofa, all that light, and it doesn’t feel too restrictive. BRILLIANT. I want this house too – every single micron of this tiny house was deliberate and makes the absolute most of the space. I didn’t realize my full name would be published in the comment above. Can you just leave a last initial for the last name please? There’s no way for me to correct that. Thanks in advance. It says “simplify” for one thing, not “simplicity”. It’s not “wasted” space, just extra space. I say that because a proper job was done to fit every thing else, enough room for seating, kitchen, clothes, bathroom etc and the owner says she wouldnt be using that space alot. You say a house needs to be functional, how is this house lacking in function? Look at the bathroom, the kitchen,the big closet, the living space. I dont see anything lacking. I would have a bigger kitchen, but I cook more than most people. But it looks very functional. If you look at most tiny houses, in fact, they have a storage loft to pack extra stuff. She doesnt need a storage loft because she has more than adequate storage space in other places, that does not mean the space is being misused or wasted. Thats silly! Especially the space below that loft is a fantastic bathroom. If someone else else uses this layout they may put an extra bedroom, an office, storage, etc. Opps, sorry! I was reply to IP FREELY. I agree 100% with you SC, I love everything about this tiny home! This is the best interior design of a Tiny House that I have ever seen! Love the African inspired theme. Nice job! I watched your episode about 10 times! I really love your finishes and walk in closet is ideal for women who need it all,but tiny. I would like it with a downstairs sleeping space. You did a great job! I watched it 10 times too lol. Why? I simply could not believe how much she packed into this tiny house – and by how much she packed I mean style and function- not stuff. The best Tiny House by far that I’ve ever seen. I think I’ll watch it the 11th time. Makes me want one too! And she’s on the lake!! How perfect with that Juliet balcony??? And how do you get up to the second loft? you have to go to the website to see the kitchen. Hi. I am in CLT and would like to know where there are communities or spaces to put a tiny home. Please call. I’ve personally toured this home, and it is absolutely gorgeous. “Ms. Gypsy Soul” designed it to fit her needs and wants, and it works for her. Kudos to her for a beautiful design. Wow, this is FABULOUS! So light and airy with all those windows. The porthole windows are awesome, as is the attached porch. I’m just wondering how one gets up to the loft where the papasan chair is, and I don’t see a kitchen. Is there one in the house? I think the kitchen is under the primary sleeping loft. Too bad there was no photo of it. As for the second loft there are bars on the wall so it seems you are to climb up there. I’m not sure exactly how though! All in all quite lovely and she has decorated in a way that is very personal to her. A great use of color. There are photos of the kitchen area in her photo gallery. The kitchen is located in a narrow hallway that connects the living room with the back screened in porch, and beneath the master bedroom. It is a rather subdued kitchen, so it’s easy to miss, but it’s definitely there. More pictures of the house, including the kitchens are here on her site. Her site is quite nice and professional looking, I must say. I guess this qualifies as a Park Model. Very nicely done up. Not a park model if with is 8’6″ wide and less than 400 sq/ft. It is a park model. According to the RecreaA park model RV (also known as a recreational park trailer) is a trailer-type RV that is designed to provide temporary accommodation for recreation, camping or seasonal use. PMRVs are built on a single chassis, mounted on wheels and have a gross trailer area not exceeding 400 square feet in the set -up mode. The décor is fabulous.! Lots of heart and soul. One of the nicest homes I’ve seen, and I am always looking. The porch extends the living space nicely. Congrats on a job well done. she did this perfectly. first it is functional. secondly it is exceptionally well crafted, and last it is exactly to her taste. This is the IDEAL of the Tiny House Movement. also she did invest some of her own labor. This is a THOW, it is 30ft I believe. Park models are bigger, usually 10-12ft wide. The kitchen is on the other end, near the porch. It is beautiful. Just saw the episode featuring this house on one of the tiny house shows. Definitely one of my favourites. The porch and balcony are a great touch, so many great features and the overall light and spacious feeling make it a winner in my book. Fabulous! One of the best tiny houses I’ve seen. Love that the laundry is right in with the bathroom rather than in a hall or in the kitchen. I also love the kitchen except I can’t live without a real oven but that would be an easy change. Where do you put your clothing? Did I miss a closet area? she has a big walk in closet across from the kitchen. It has a face on the door. you would have to watch the video to see the inside. Where’s the kitchen? Several photos of the bathroom, but where’s the kitchen? Loved the rest of the house. Very nice,Shame its not a TH,really. No wheels anymore.No Kitchen. Just a make up shack.Dont even see a shower,so i guess its at the bottom,of someones garden,as a getaway?Really nice but should not be on here.Maybe woman cave? There is a shower in the bathroom. Also a kitchen. 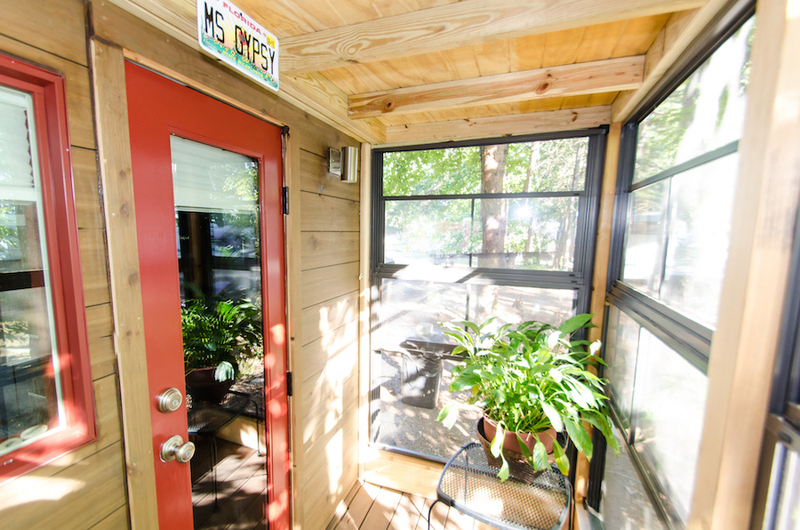 Go to her web page and there are photos showing even more of this wonderful tiny home. I seriously think you need GLASSES. The wheels are quite apparent in at least one picture. And can you take a good guess at what is behind the SHOWER CURTAIN in the bathroom??? Do try, and spare the world you snarky attitude. This design is like Gabriel Morrison’s. The width is extended to cover wheels and give more living space. Sublime. This is art…..craft…..a great expression, to be used. Architecture in a pure form. Well done. Gee, I see wheels. I see the hint of a kitchen counter from across the main living area, to the left of the stairs. (And full pics of the kitchen on her fabulous linked website.) I see a shower curtain, to the right of the bathroom sink. Assuming therein lies your missing shower. It does seem spacious, but perhaps that’s due to the cleverness of the design. Because it’s a TH, you have to look more carefully! Well done, Ms. Gypsy Soul! Oh heaven, how elegant and liveable! You have to see the gallery on her site. And yes, it does have wheels, but that’s not mandatory, folks. Unless they’re blown sideways, yurts don’t roll either. “Unless they’re blown sideways, yurts don’t roll either.” So funny! This made me laugh this morning. Nice positive attitude. Wow! This is one of the best Tiny Homes I have come across. Great Job! I love this but I have one question for anyone who knows. When you’re in the kitchen, what’s behind you? See the white wall with a woman’s head on it? Is that a closet? If so, wow! That’s an amazing closet! cost you 2 dollars to see it, though. Being obsessed with tiny houses like I am, I brought the whole series. Thank you for sharing. I just watched it and yes I’ll be watching all of them! One of the best tiny houses I have ever seen on this site and I have been following for years. So much light and places to sit comfortably. A wonderful personal expression of this gypsy soul at rest in beautiful surroundings. Not much I would change except the colours to be more my own space. I love the look of this house. Everything is designed to fit so well in the small areas. Again, this is a wonderful floor plan. The way you have it decorated is just beautiful. I know my husband would ask where you put the 50 to 60 inch tv. Not me!! I remember seeing this awesome home being constructed on TV. The Sister found the right builder and Interior Designers to work with her. She did an awesome fantastic job! So impressed I am that I would love for her to contact me. She and that team should be building and designing homes together. Hey, hola at a sistah if you see this msg. This place is fantastic. I love the colors, the porch and all the windows. Very light and bright. However, I would want more space in the living area up front so I would think about relocating the bathroom to where the closet is and turning the extra space in the back into a closet. If you check out her Facebook page you will see that that dog is very well taken care of and probably spoiled. :} I doubt it spends much time in the cage unless it wants to. Some dogs like their cage/kennel. I have seen this home in person. We spent about 1-2 hours and trust me, he is not locked up and he is treated WELL. I don’t know if this was mentioned (I only skimmed the comments, sorry!) but there was an episode about this home on Tiny House, Big Living where you can see it being built and the final product. You took just about every word out of my mouth! It is gorgeous! And defines who she is and opens the windows of imagining tiny living beond ‘rustic’! I’m in love with the syle and the extras like the walk in closet ( I would save some space in there for clothes, but it’s a perfect place for my books! It’s a cupcake for the eyes and deliciousness for the soul! Love this home! What are the dimensions of this home? Maybe I am going crazy…but are there pictures of the kitchen? Nonetheless, very well done. It is beautiful. I must say, you have truly set the bar high. It is absolutely beautiful! After seeing this, my husband and I are thinking about do it as well once the kids are gone. 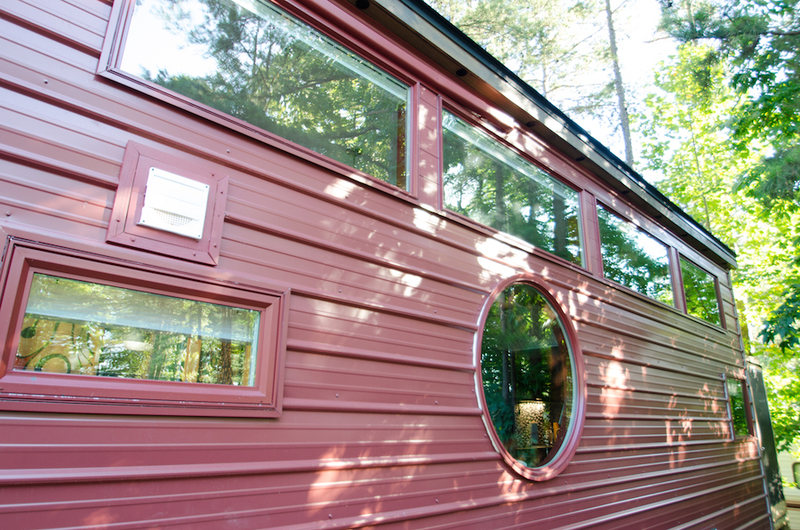 Beautiful tiny house…one of the nicest I’ve seen on the show. Your mini house is my favorite! Seems bigger than most, put together right!! Great Job! I watched the episode on HGTV , and I plan on contacting MS. GYPSY SOUL…. LOVE IT!!!!!! This is ripe for the picking. Build your Small House in Huntersville, NC. on a ac. lot, dead end street, large tree well over 100 yrs old. Driving fifteen min to lake for boating/ fishing and water sports. Property is located on paved road nested behind beautiful develop homes. Call for more info: 386-246-3986.